Charles Coolidge was head draftsman in H. H. Richardson’s office at the time of the architect’s death, and became partner in the subsequent firm of Shepley, Rutan & Coolidge. 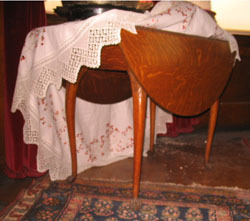 John Glessner credited Coolidge for the design of the original dining room table, which is currently missing, and dining room chairs, as well as of the unique partners desk in the library. Born in 1858, Coolidge graduated from Harvard University and took a special architecture class at MIT. In 1892 he moved to Chicago to oversee various projects, including the Chicago Public Library (now the Chicago Cultural Center) and the Art Institute. His work with academic institutions, including Harvard, was also widely recognized. Coolidge returned to Boston permanently in 1900, but the Glessners and Coolidges remained close friends for the remainder of their lives. He was one of the original partners at Richardson’s firm and continued his work at there until his death in 1936.